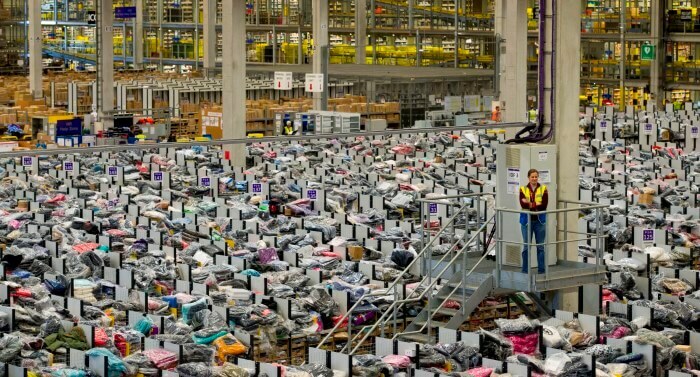 Amazon.com is the largest online retailer in the world and had 18 distribution centers in Europe at the end of 2015. It has been building an immense infrastructure in the last couple of years to be able to fulfil the promises it makes to the consumer (quick delivery, high availability, low shipping costs, etc.). Cartons must weigh no more than 15 kg. If a single shippable unit weighs above 15 kg (see examples outlined in Sections 2.2.9 and 2.2.10), attach warning labels as appropriate on 4 sides of the carton (see Section 3.4 for further information on warning labels). The max weight with warning labels is 30kg. Do not let cartons overhang the edges of pallets. 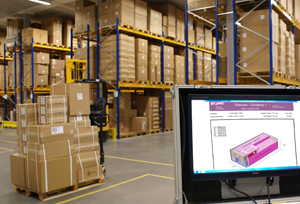 When shipping multiple SKUs on a pallet, physically separate the SKUs so that they are unmistakably easy to differentiate upon receipt. Pallets must be center loaded. So the gravity of the pallet is in the center as much as possible. Altough these restrictions seem simple, compliance is necessary. You can only deliver under these strict conditions, within a limited timeframe. When you don’t comply to one of the conditions, your goods will not be accepted, you will not get paid and you will get a fine on top. The demands that Amazon dictates make the logistical process more complicated. On top of that, Amazon in not the only party that has its own logistical demands. Also at Zalando for example you deliver at a giant warehouse where you can only deliver during an agreed time window, at a specific loading dock, on pallets with a specific size, etc. Your employee is not aware of the complete list of logistical demands, e.g. because he is a flexworker. People make mistakes without knowing, this will result in inefficiencies or even fines on your end. Your employee is aware of the fact that logistical demands are involved in the order but he does not know the restrictions by heart. Valuable time will get lost in the process of looking up the restrictions. Your employee does know the restrictions by heart, but was not aware of the latest update that your customer had introduced recently. To avoid the problems above, FPC has developed the stacking tool StackAssist. StackAssist processes the customer specific demands directly into the stacking instructions. You only have to register the demands (and updates) once in 1 central location, and the demands are linked to every new order coming from this customer. Thanks to the visual instructions of StackAssist people don’t lose time thinking about how to stack the products on the pallet and which customer restrictions are involved. Also lost in the tangle of logistical demands? Or are you only just able to keep the overview? contact us and we will give you a tailored advice!